It doesn’t feel like it has been over a year since I’ve written a post here, but evidently it has. Oops. I’m not short on ideas, but short on time. I actually have a few drafts cooking. But those shall continue to sit on the back burner as I make a few comments on the recent demolition of the University Club. The University Club was never an original feature of this site. I had my eyes pretty much set on downtown. Heck, the University Club wasn’t even abandoned at the time most of these pages were written. But I photographed it, none the less. As I noted in a prior post, the building’s demise provided me an opportunity to see the forces of destruction firsthand, unlike the Statler or UA, both of which were fairly destroyed long before I ever saw them. The building, as handsome and pristine as it was when I first saw it, had taken a slight turn for the worse before my final visit in August. The University Club’s downfall accelerated after being purchased by Albert Ammori in 2010. Efforts by preservationists to get the building protected were rebuffed by the City Council’s rejection of local designation in a dramatic session where Councilman Kwame Kenyatta declared it a relic of “slave institutions” and expressed his wish that it be destroyed. Lacking any protection, the building was left open to the elements and, as noted in my prior post, its interiors were heavily vandalized. That was outdone this past summer when a massive fire gutted the building, destroying what was left of its elegance and putting the final nail in its coffin. Arson has been alleged. Despite all of this, and against my better judgment I decided to have one last look. 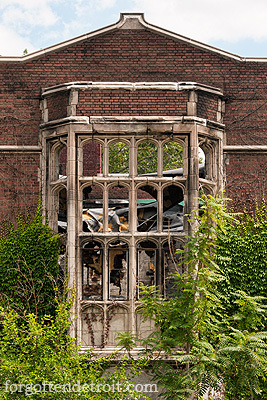 The University Club’s Collegiate Gothic and Tudor exterior was, for the most part, intact. By that I mean at least the walls were still standing. Much of the roof, however, was gone. The interior was a total loss. Sadly the bulk of the damage was concentrated in the most architecturally significant areas. The wing of guestroom/offices and the basement had largely been spared from fire damage, although there was considerable smoke damage. 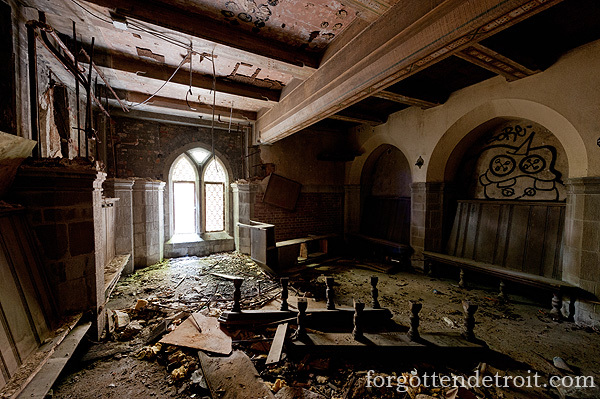 The dining room was the most disheartening, as it was the building’s signature space. 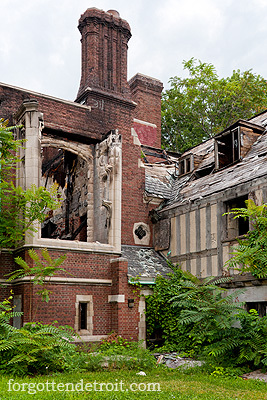 With the lone exception of the room’s Tudor windows, it was completely unrecognizable. The woodwork, the ceiling beams, the fireplace, and the stone details were gone. Attempts to line up photographs similar to my earlier shots were nearly impossible due to the debris from the collapsed roof. 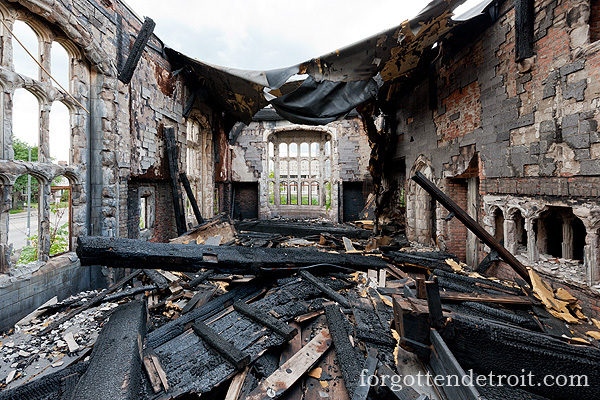 All that remained of a roof were a few tattered shreds of membrane. 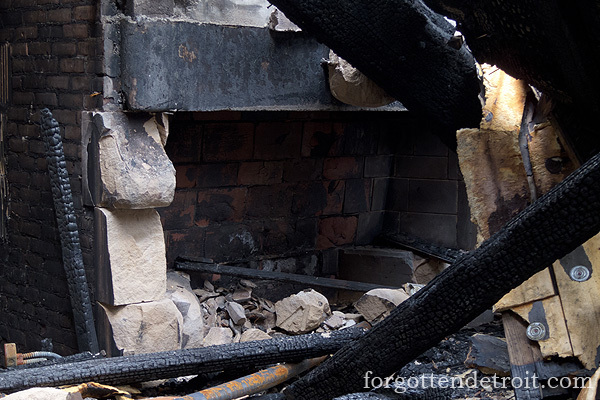 The spaces around the dining room, including the stairs and library, were charred beyond recognition and reduced to their bare structural components. 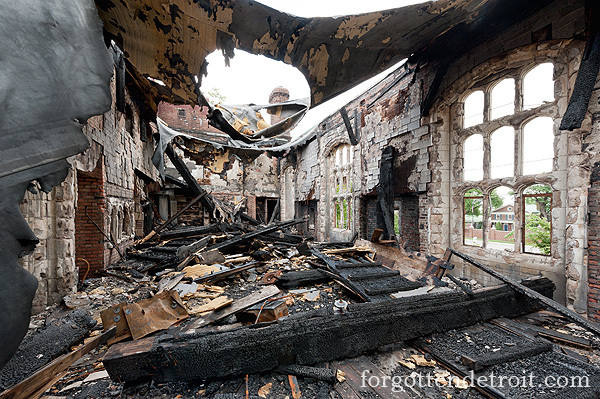 The fire had accomplished the task of destroying the University Club’s architecture long before the wrecking ball arrived. Suffice to say, I can’t say I was shocked to hear that the club’s remains were pulled down this week. It was the final act in a predictable and, perhaps, inevitable story. I can’t even say I was shocked to read reports that the building’s replacement will be a McDonald’s. Not shocked, but certainly disappointed. Although it was unrealistic to hope that the building would be saved, I would like to think it was realistic to hope for something better than a McDonald’s. No surprises though. Tearing down architectural gems for fast food establishments is an established tradition on Jefferson Avenue. Remember, the Chene House was demolished for an IHOP and the Jefferson Avenue Baptist Church fell for a Wendy’s. I suppose it is only a matter of time before the Hannan Memorial YMCA becomes a KFC, the Vanity Ballroom a Chuck E. Cheese, and the Brodhead Naval Armory a Long John Silver’s. I try to kid, but it will probably come to pass. I hate to be so negative with this post, but this isn’t a story with a happy ending. As I’ve said, none of this surprised me. I pretty much knew the building was doomed long before any of the deterioration occurred. Putting aside the challenges of adaptively reusing a building built for a specific, now obsolete, purpose, the fate of the University Club has been replayed in this city more times than anyone can record. The story is so familiar that when it doesn’t go according to script, and a building is saved, it is truly remarkable. In a recent piece in the Detroit Free Press, John Gallagher did a good job of outlining the problems in the city that result in the countless University Club stories, including lack of code enforcement and policing. While I doubt that preventing the vandalism and destruction of vacant historic buildings will be the number one priority of mayor-elect Mike Duggan or the Emergency Financial Manager Kevyn Orr, and it shouldn’t, I guess it is ok to be optimistic that the city’s new leadership will eventually result in better city services and functionality, which will eventually lead to more policing and code enforcement, which will eventually lead to greater protection of buildings. Failing that, it is important that preservationists do not allow themselves to become too jaded. While the University Club’s fate did not, there have been other stories with endings that have surprised me. Among others, I never expected the Fort Shelby to reopen. What can we learn from this? I believe an important lesson here is to identify at risk buildings and develop a reasonable plan of action as early as possible. The longer you wait before action is taken, the less likely the chances for success. The University Club’s fate might have been averted in 2008 or even 2009. However, with each passing year the more certain this week’s demolition became. It also is worth considering solutions outside of the box. Blight ordinances and local historic designations did nothing here. Honestly, I don’t have many answers and nothing I have to say on the matter is really mindblowing. The University Club is gone and it’s fate was sealed long ago. We can take the opportunity to reflect and be better prepared for the next endangered building. There will be more loses, more than I care to think about. But maybe, just maybe someday perhaps the Vanity Ballroom will be renovated instead becoming the site of a Chuck E. Cheese. And maybe, just maybe, the lessons learned from losses like the University Club will have helped in that development. I don’t know. But what I do know is that there are plenty of superior eating options in the city than McDonald’s. Perhaps the saddest part of this might be the active hostility towards this building from those who might have been able to save it. One may not like parts of history, but in erasing it we leave nothing from which future generations can learn. I love this website, its great to see pictures of the old buildings. I’m from Ann Arbor. Thank you for your hard word and dedication. 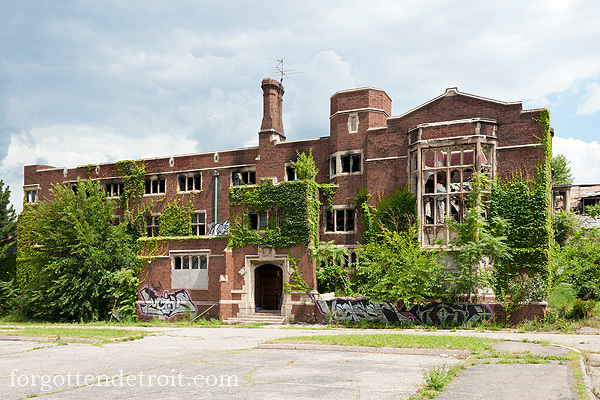 I found your site after finding a 1995 article I had saved from my local newspaper entitled “Restoring the city that murders hope” (not such a great title) but its about the vacant buildings in Detroit at that time. I think we’re all trapped in our fond memories tied to structures but reality is some of them were built on the back of others. There are no economic uses for them because these same forces drive US economy elsewhere. I think the goal has to shift away from maximizing profits out of county to what may be lower profits but ones that sustain economies in this country. We will find a way.